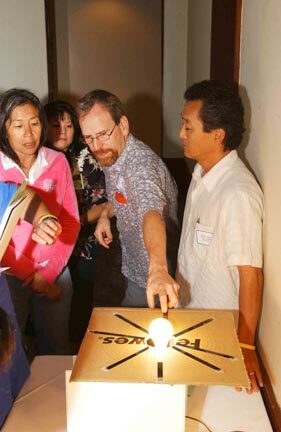 Teachers conduct the high school lesson Thermally Habitable Zones at a 2005 Journey through the Universe educator workshop in Hilo, Hawaii. As part of the grade 9-12 Unit of the Are There Other Neighborhood Like Our Own? Module, this lesson uses bulbs of different wattage to serve as remarkably good analogs to different luminosity stars. Temperature sensitive liquid crystal strips, positioned radially relative to the bulb, identify the Thermally Habitable Zone around the ‘star’, which is the annular region around the star where liquid water can exist. This physical analog very effectively demonstrates that the higher the luminosity of the star, the farther away, and wider is its Thermally Habitable Zone. The wider the Zone the higher is the probability that a planet formed in that zone—a planet potentially capable of supporting life. The lesson also includes discussion of the lifetime of stars, with the shortest lifetimes for the higher luminosity stars. Thus stars appropriate for astronomers to explore for Earth-like planets are those with reasonably wide Thermally Habitable Zones, but also lifetimes long enough for life to evolve—stars like our Sun.